This is an exclusive construction video tutorial on staircase. 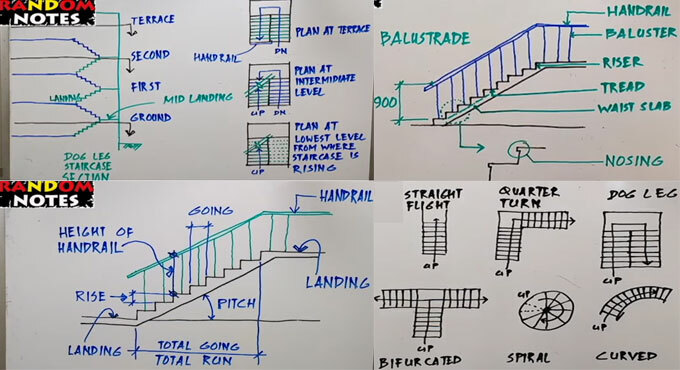 The tutorial provides detailed information on the various parts included in staircase as well as basic conceptions about its design and depiction. A flight of stairs is generally described as an incessant series of stairs. It signifies the set of stairs among floors or the set of stairs among landings. There are horizontal and vertical surfaces in the flight of a staircase. The vertical surface is known as riser and the horizontal surface is known tread. The combination of these two create the step is formed by combining these two together. The vertical dimension that is enclosed in one step is known as the rise. The horizontal dimension enclosed in one step is known as the going. The slope or pitch of the stairs refers to the proportion among the rise and the going. It is also known as the rake of the stairs. The pitch line stands for the imaginary line along the tip of the nosing of the treads. A staircase rises up at an angle from the horizontal. So, stair pitch means the angle the pitch line creates with the horizontal, calculated in degrees. The value of the slope, as a ratio, becomes the tangent of the pitch angle. Upto a maximum of 42 degree is recommended for pitch. While rising from starting level to the last level, the horizontal distance covered by the staircase is described as the total going or total run. If handrails exist in staircase, there should be minimum width of 900 mm among handrails for smooth usage. To obtain more detail information, watch the following construction video tutorial.